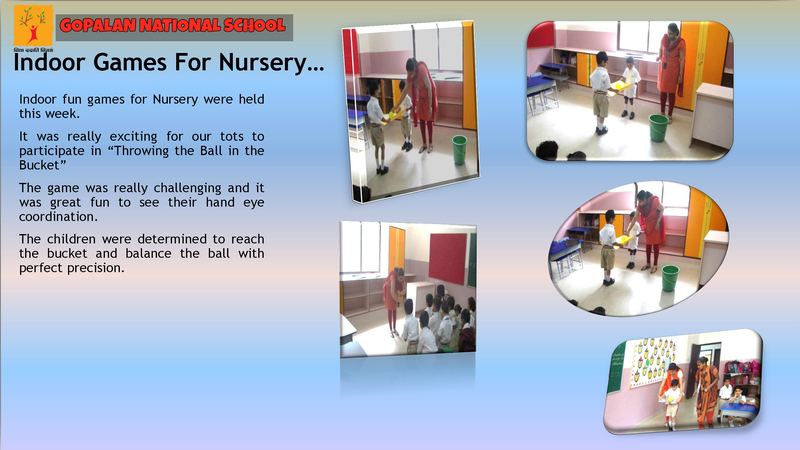 Our budding champions of Nursery were actively engaged in Pink Tower activity iconic to the Montessori classroom. Stacking the cubes calls for visual discrimination coordination and precision. Indirectly our little ones are preparing themselves for understanding cubed roots in later Math. 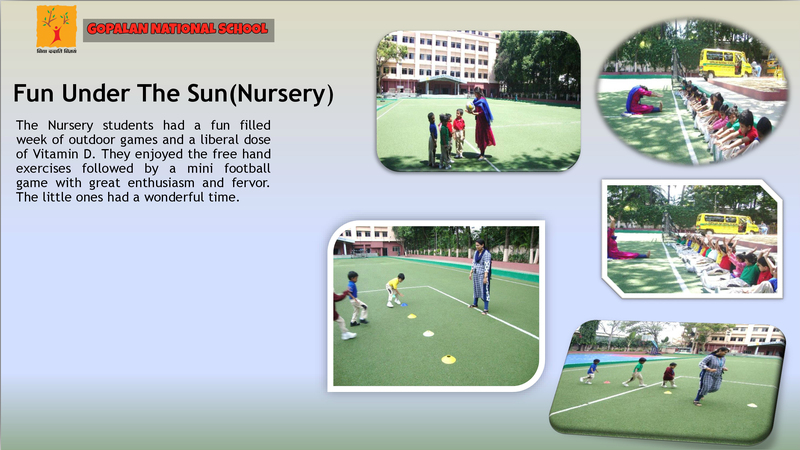 The Nursery students had a fun-filled week of outdoor games and a liberal dose of Vitamin D. They enjoyed the free hand exercises followed by a mini football game with great enthusiasm and fervor. The little ones had a wonderful time. The children thoroughly enjoyed their tryst with the slides, swing and other apparatus in the park and had a great time being completely carefree. 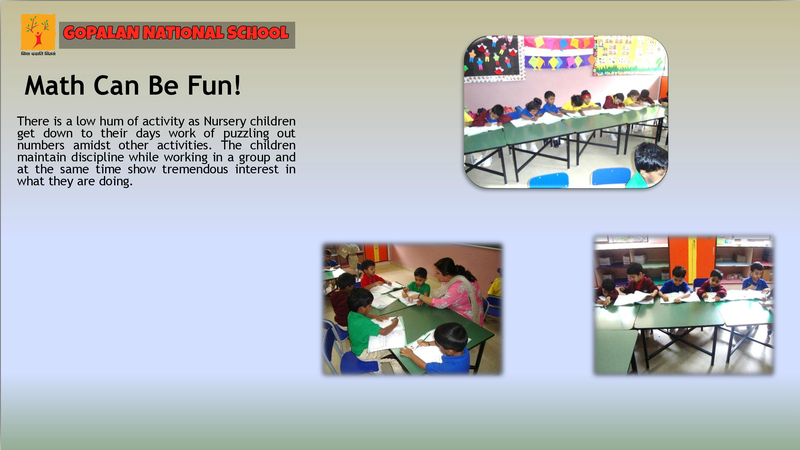 Indoor fun games for Nursery were held this week. The game was really challenging and it was great fun to see their hand-eye coordination. There is a low hum of activity as Nursery children get down to their day's work of puzzling out numbers amidst other activities. The children maintain discipline while working in a group and at the same time show tremendous interest in what they are doing. 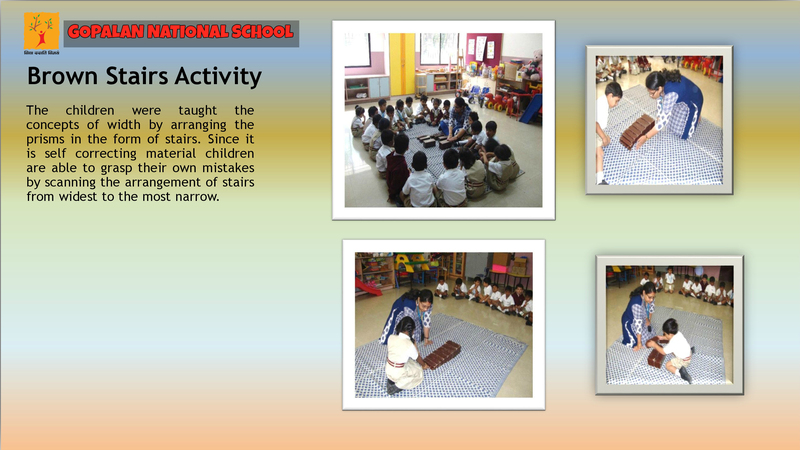 The children were taught the concepts of width by arranging the prisms in the form of stairs. Since it is self-correcting material children are able to grasp their own mistakes by scanning the arrangement of stairs from widest to the most narrow. Hamare Preparatory ke nanhe munhe utsahi aksharon se jude chitron mein rang bhar ke hindi paath ka poora ras le rahe the. The children of preparatory were thrilled to shake a leg to different kinds of music. They were enthralled by the concept of free movement and carried off the class with aplomb. 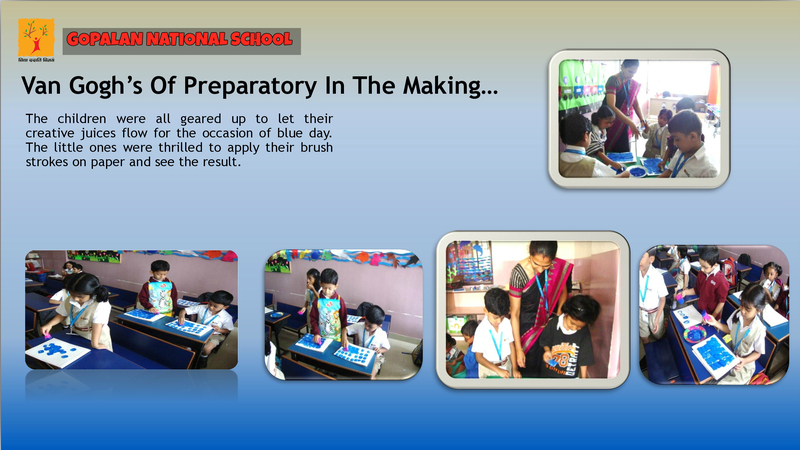 The children were all geared up to let their creative juices flow for the occasion of the blue day. The little ones were thrilled to apply their brush strokes on paper and see the result. 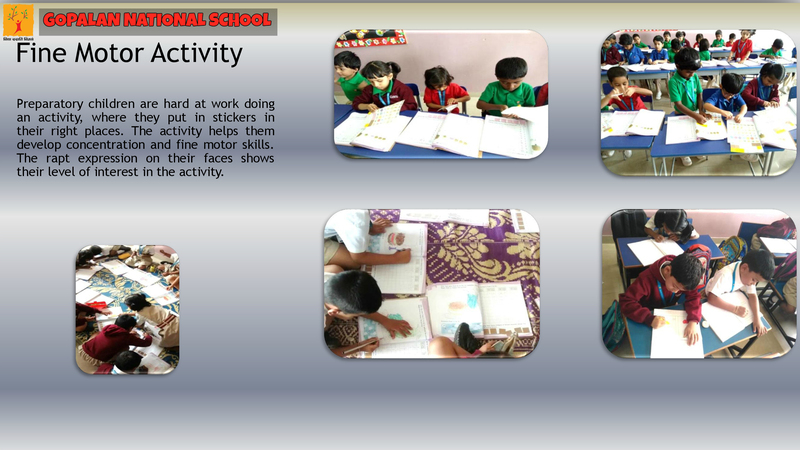 Preparatory children are hard at work doing an activity, where they put in stickers in their right places. 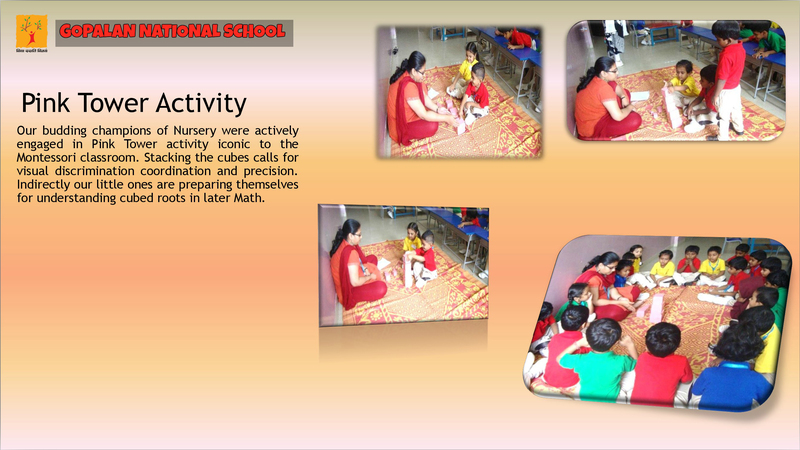 The activity helps them develop concentration and fine motor skills. The rapt expression on their faces shows their level of interest in the activity. Life in Preparatory is definitely not only about academics. 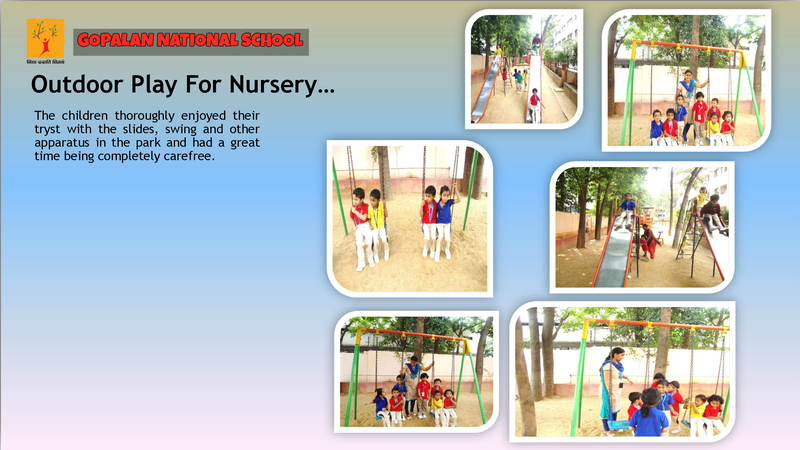 Children have their time and space where they refresh their mind and senses through outdoor play.